Yarchen Gar lies 400km west of Chengdu, in the old Tibetan province of Kham, and currently in Pelyul County, Garzê Tibetan Autonomous Prefecture, in Sichuan province, China. Yarchen Gar is open to foreigners all time, unlike Larung Gar in Sertar which is at present closed to foreigners. Also known as Yaqên Orgyän Temple, Yarchen Gar lies in an isolated valley 4000m above sea level in Sichuan, China. It is associated with the Nyingma tradition of Tibetan Buddhism. 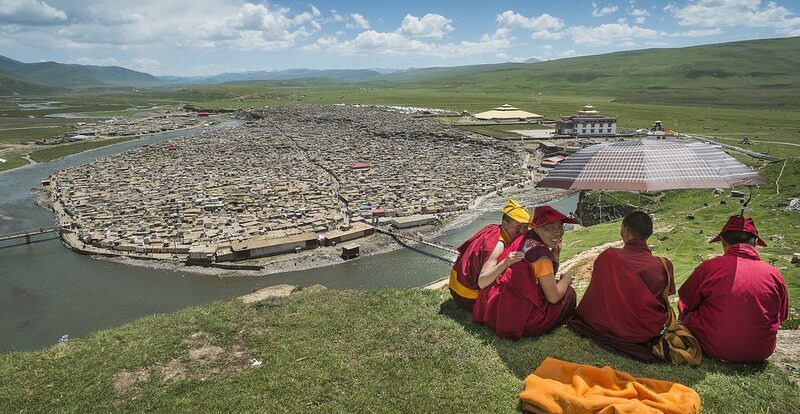 There are about 10 000 monks and nuns, making it possibly the largest monastery in the world. A river encircles Yarchen Gar, the huge, sprawling hermitage home of many thousands of Tibetan Buddhist nun. A small cluster of monks live on the opposite bank. Yarchen Gar, like Larung Gar is alive with Buddhist study of every kind. But the Tibetan nuns here focus on practice rather than philosophy. Tiny meditation huts dot the hillside leading to a huge shining statue of Guru Rinpoche and spread out around the edges of the encampment. After mastering some fundamentals, nuns undertake a meditation retreat of 100 days in these minute huts. During the retreat, they don’t leave their huts except for bathroom breaks. They eat what is brought to them and meditate night and day. Yarchen Gar is open to foreigners, it is true, but you need to register at local police station after your arrival there. You need to bring your original passport and an itinerary of your last and next stop before and after Yarchen Gar. You need to register with local police so they know about your visit. The police station is located about 4km before you reach Yarchen Gar. It’s best you go register voluntarily after arrival. Or local police will ask you to if they happen to see you. Police will check and register your passport and Chinese visa. But for sensitive places like Yarchen Gar, you can never be 100% sure of. Like during the politically sensitive month of March, local authorities may make Yarchen Gar inaccessible for foreigners. -Yarchen Gar is open to foreigners; Larung Gar is closed to foreigners. -Yarchen Gar was built around the bend of a river, almost surrounded by it; Larung Gar was built all around the steep surrounding hills in the valley. -Yarchen Gar is mostly home to female nuns, and the whole ‘city’ inside the river is home to nuns and off limit to monks; Larung Gar was mostly home to monks. At Yarchen Gar, male foreigners can cross the bridge and walk around the outskirts of the nuns living quarters, but you cannot to walk inside the female nun’s living quarters. If you are planning a trip to Kham in Sichuan Tibetan areas, we can help you to plan a non-touristy trip of Kham that gives you an authentic Sichuan Tibetan experience. Previous postTravel with Children to Tibet – Family Tibet Tours!